The below article refers to “HappyFox New” version. If you are in “Classic HappyFox” then refer to this article. Contacts in HappyFox are customers or end users who raise tickets. HappyFox allows you to maintain a profile for all your customers making communication easier. Once a customer raises his first ticket, he is automatically added to your contacts. You can also manually add contacts or do a bulk import. To add a contact manually, login to your account, click on the “Contacts” option from the Top menu. The contacts page displays a list of contacts and contact groups, Choose contacts section in it. To add a new contact, click the “+” icon beside “All Contacts” title. Tips: If you want to add more than one contact, refer our “Import Contacts” article to proceed. The Import Contacts link will be accessible only for the account admin. This feature is available for accounts on all pricing plans. Full Name - This will be the contact’s name you would like to save it as. Email ID - Your contact’s email ID through which he has/will raise tickets should be entered here. Phone Number - Your contact’s phone number. 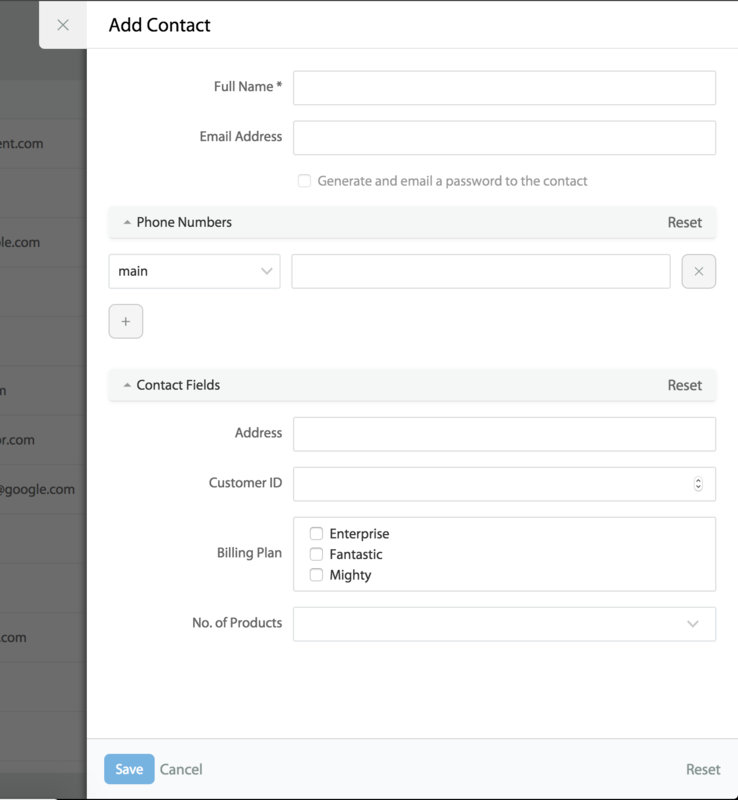 Contact custom fields - These are the custom fields you had created to record more information about a contact apart from his personal information such as the billing type, the customer type(VIP, Enterprise) etc to provide a personalized support. You can choose to add more information while you create the contact or later from ticket > custom fields sidebar as you respond to their tickets. 3. Select the “Generate and email a password to the contact” option to email the contact an auto-generated password that the contact can use to log into support center and click save. 1. Click on the name of the contact in the Contacts page which opens the “Contact Details” page. 2. Clicking the “Ticket Count” above the pending/all tickets will navigate to ticket list page showing all the tickets raised by the contact in pending/all queue. 3. The sidebar will display an editable list of contact groups that the contact is associated with and list of custom fields. 4. Recent tickets display the recently updated tickets of the contact. Note: Agents can view only the tickets he has access to as per the permissions he/she has. To delete a contact, click the “More Actions > Delete”, which will prompt a dialog box which reconfirms that contact delete will delete the tickets associated with the contact as well. To confirm the delete, click the “Delete Contact” button, or to cancel the delete operation, click the “Cancel” button. Agent(Staff) with permissions to “Add Contacts” will have access to create, edit and delete contact information. They can also view contacts who have created tickets in other categories the agent does not have access to. For Agents who do not have “Add Contacts” permissions, only the contacts who have raised tickets in the category the agent is associated can be viewed. I do not want all my agents to view all the contacts. Agent-Contact viewing permission is governed by the “Add Contact” permission present under the “Roles & Permissions” settings. If this permission is disabled, an agent can only view contacts who have raised tickets in the category that the agent has access to. For example, if an agent has access to A & B and the contact X has raised tickets only in Category C, then if he does not have the permission enabled, then he will not be able to view Contact X.
I cannot view a contact on search which I know exists in the account. I do not see the “Change contact” in ticket more action. Only Agents with “Change ticket Contact” permissions can do this action. Make sure this permission is enabled to view that option. I do not see the “Import Contact” option. “Import Contact” is present only for the account administrator. If you are the account admin and still do not see the option reach out to us. 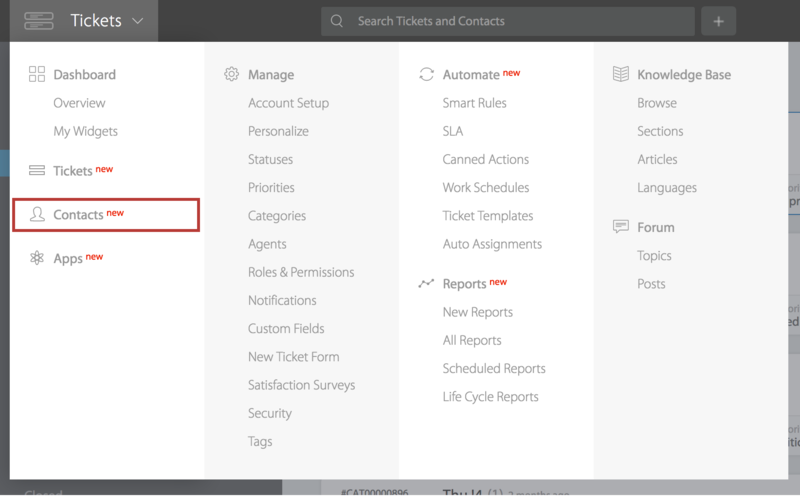 You might also want to read Change ticket contact, Create contact group, Merge Contacts.